542-250 Dr. Jeannette Graf, M.D. 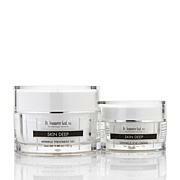 This 3-piece Skin Deep set is formulated for those concerned about aging skin that appears dry and for those with the look of medium to deep lines and wrinkles. 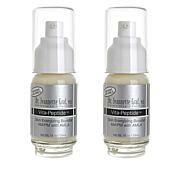 Apply Wrinkle Beauty Treatment Gel to cleansed skin at night. For best results, apply after Skin Deep Wrinkle Serum. Apply Neck and Throat Creme to cleansed neck and throat areas in the morning and evening. Wrinkle Beauty Treatment Gel will not produce an overnight result, but you'll begin to notice a difference after a few weeks of continued use. Neck and Throat Creme is formulated with key ingredients, including Peptide 3 Complex. Wrinkle Serum's concentrated formula is a combination of ingredients, including pentapeptide-4, pentapeptide-7/oligopeptide, acetyl hexapeptide and hyaluronic acid. Ingredients: Deionized Water, Methylpropanediol, C12-15 Alkyl Benzoate, Homosalate, Octisalate, Glyceryl Stearate SE, Cetyl Alcohol, Glycerin, PEG 100 Stearate, Cetearyl Alcohol, Ceteareth-20, Sodium Polyacrylamide, Oxybenzone, Salicylic Acid, Copper Tripeptide-1, Palmitoyl Pentapeptide 4, Palmitoyl Tetrapeptide-7, Glycerylamidoethyl Methacrylate / Stearyl Methacrylate Copolymer, Thymus Serpillum (Wild Thyme) Extract, Lupinus Albus (Lupin) Extract, Kigelia Africana Fruit Extract, Niacinamide, Gamma Aminobutyric Acid; 4-Aminobutanoic Acid, Caprylic/ Capric Triglycerides, Glycine Soja (Soybean) Oil, Vitis Vinifera (Grape) Seed Oil, Cocus Nucifera (Coconut) Oil, Persea Gratissma (Avocado) Oil, Aloe Barbadensis Leaf Extract, Squalane, Xantham Gum, Dimethicone, Butylene Glycol, Hedera Helix (Ivy) Extract, Arnica Montana Flower Extract, Anthemis Nobilis Flower Extract, Anacyclus Pyrethrum Root Extract, Sambucus Nigra Flower Extract, Cucumis Sativus (Cucumber) Fruit Extract, Lycium Barbarum Fruit Extract, Euterpe Oleracea (Fruit) Extract, Punica Granatum (Fruit) Extract, Vaccium Macrocarpon Fruit Extract, Hydrolyzed Oat Protein, Hydrolyzed Wheat Protein, Avena Sativa (Oat Kernel) Extract, Ascorbyl Palmitate, Pyridoxine, Panthenol, Cholecalciferol, Retinyl Palmitate, Tocopheryl Acetate, Phytonadione, Sodium Hydroxide, Polyacrylate-21 and Acrylates/C12-22 Alkylmethacrylate Copolymer, Tetrasodium EDTA, Phenoxyethanol, Benzyl Alcohol, Potassium Sorbate, Tocopherol, Parfum (Fragrance). Ingredients: Water, Glycerin, Cyclomethicone, Phenyl Trimethicone, Dimethicone Copolyol, Dimethicone/Vinyl Dimethicone Crosspolymer, Ethoxydiglycol, Polysorbate 20, Palmitoyl Pentapeptide 3, Sodium Chloride, Butylene Glycol, Carbomer, Propylene Glycol, Diazolidinyl Urea, Methylparaben, Propylparaben. Ingredients: Aqua (Deionized Water), Glycerin, Dimethicone Crosspolymer, Cyclopentasiloxane, PEG/PPG-18/18 Dimethicone, Hyaluronic Acid, Niacinamide, Palmitoyl Pentapeptide-4, Palmitoyl Oligopeptide, Palmitoyl Tetrapeptide-7, Acetyl Hexapeptide 8, Phenyl Trimethicone, Butylene Glycol, Ethoxydiglycol, Polysorbate 20, Carbomer, Hydroxyethyl Cellulose, Triethanolamine, Phenoxyethanol, Ethylhexylglycerin. 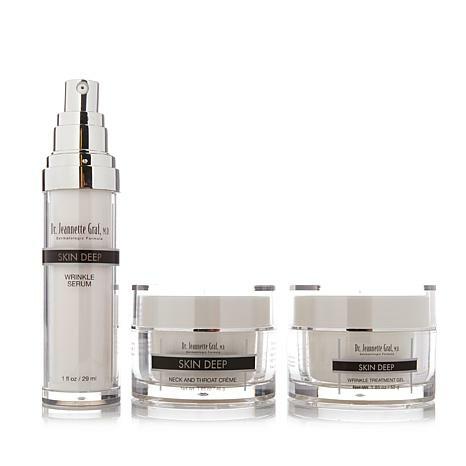 I have used skin deep for years and glad to try the neck cream and serum. Is working as I hoped! Love it all + matching eye cream. Only exception is neck cream too thick; will try mixing w/serum or gel. Otherwise GREAT, have repurchased all & will continue! Not sticky or greasy! Love gel consistency! Moisturizing & looks like contains matrixyl chemical peptides that I love & have had great results with & seem to be the rage these days; pleasant surprise! 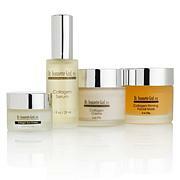 Also lIke retinol serum/eye cream & ferulic serum/cream! Reasonably priced + better than the more costly! Thx Dr Graf! Product did nothing for me. Didn't show any signs of improvement, or that it was working.